I’ve been making yogurt (and many other fermented foods) since 1998. But unlike many other DIY yogurt-makers, I’ve made every batch from the same starter culture I began using when I first started making yogurt with great success. When I first started making yogurt, I tried using one of those single-purpose “yogurt maker” machines as well. My yogurt was consistently mediocre. I look back at my first attempts as proof that technology is no substitute for knowledge, wisdom, experience, intuitive experimentation and keen observational skills. Instead of giving up like many people do, I was determined to get the yogurt of my dreams at home: sour, creamy, consistent (but not too thick!) texture. 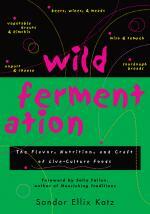 Along the way, I learned a lot about yogurt cultures and fermentation in general. Wait a minute, here. Let’s stop and think about what we are doing. Joel Salatin of Polyface Farms is famous for pioneering more just, sustainable and productive forms of agriculture. He sells milk, beef, eggs and poultry. But, in his words, he’s not a milk, beef, egg or poultry farmer. He’s a grass farmer, and maintains grass-based ecosystems. The cows and chickens he raises are actually a “by-product” (sic) of that system. If he has a healthy grass ecosystem, he has happier and healthier cows and chickens, who in turn provide great-tasting milk, beef, eggs and poultry that are arguably also healthier for us (e.g, in their balance of Omega-3 and -6 fatty acids). We can use Joel Salatin’s example to describe a successful food fermentation process: we don’t “make fermented food” — we are microbial farmers focusing on supporting communities of micro-organisms. The fermented food is just a wonderful “by-product.” If our microbial communities are happy, then our fermented food will turn out excellent. My yogurt is wonderful. Batches are consistent. I attribute my success first and foremost to a shift in my mindset away from “yogurt making” and toward “microbial farming/gardening.” In short: I strive to create the conditions and environment where the desirable organisms thrive. Rather than trying to “make bacteria turn milk into yogurt” I attract the bacteria I want and keep them happy. It’s a very different relationship — more of a partnership than the typical commercial “master/slave” dynamic. My yogurt culture is part of the family. It is important to me. My yogurt culture gives me nutrition. It turns an unedible (for me, at least) animal product into an edible, delicious and (arguably, more nutritious and safer) food that, at the very least, does not cause an acute detoriation in my health when I eat it. I owe the yogurt culture a debt of gratitude. I have an obligation to protect it and help it thrive. This obligation is not just moral — it is material: epicurean, nutritional and caloric. If I eat a salmon, I depend on the salmon. Through this relationship, the salmon becomes me, and I become more the salmon. I create an obligation to protect the health and welfare of the larger salmon population. I must also protect their habitat, because their habitat is now my habitat. This is not an altruistic obligation: If I don’t fulfill my end of the bargain, the salmon and I will both suffer as a result. I use the salmon example, because a healthy salmonid population is an indicator and steward of a vibrant terrestrial riparian ecosystem. Thus, the clear-cutting, water damming, fish hatcheries and poisoning, industrial farming, overfishing and global warming that threaten the salmon also threaten our terrestrial forest ecosystems. Commercial yogurt cultures are mostly like hatchery-spawned salmon or the dreaded Gammas and Deltas in Aldous Huxley’s Brave New World. Healthy yogurt cultures are more like John the Savage, in that they thrive outside the rigid confines of the factory, and die if forced into such spaces. Context is important. My job as someone who makes yogurt is not to make a batch of yogurt, but to keep the community of micro-organisms responsible for yogurt making happy and healthy. So how do we accomplish this? With a background in ecology, I knew that community diversity was (and still is) key to a strong, healthy starter culture — or what Sandor Katz of Wild Fermentation calls a “heritage-quality culture.” My first goal was to cultivate microbial diversity by attracting and retaining as many different species and strains of bacteria as possible. I use two primary techniques to attract bacteria to my yogurt culture: In the beginning, I synthesized as many different commercial yogurt cultures as possible into a single super-culture. I would buy a few containers of yogurt from different manufacturers with the most simple ingredient lists possible (ideally, just milk and bacteria, but I used flavored yogurt when plain yogurt was unavailable, and some yogurt has pectin or gelatin in it). I combined them into a single starter over the course of about ten generations (batches) of yogurt, giving them time to stabilize and balance, letting the finicky ones die back and the robust ones survive. I got consistent, OK yogurt. But I didn’t stop there. I added raw and fermented/soured oats, sourdough starter, raw crushed fruit, and raw milk from a reputable source. Then I let sugar ants into some milk. They carry a lot of bacteria with them — and rumor has it — some of the finest bacteria for yogurt making the world over. Say what? Commercial yogurt makers want you to think that they have something mystical and special and unobtainable by mere home-fermenting mortals. In reality, the micro-organisms responsible for fermenting yogurt exist almost everywhere in our environment, including inside of us (and the animals whose milk we drink). Heck, you could even throw some shredded cabbage leaf into your yogurt and isolate some thermophillic lactic acid bacteria from it. It’s a lot like making a sourdough starter. The weird things you do to get it going needn’t exist in the finished batch. I want to expand on the above point a little more: many places on these interwebz train us to dichotomize and categorize fermentations, but every fermentation from a healthy “heritage quality culture” will have various yeasts, aerobic and anaerobic bacteria in it. Once you get all the micro-organisms assembled, the medium or substrate (e.g,. the milk) and the process you use select for species dominance over time and batch. Second, learn the difference between sanitation and sterility (more on this later). During fermentation, we want to follow sanitary practices and avoid sterility. We humans are mutual (or at least commensalist) symbionts with bacteria, too: The same bacteria that make yogurt also live in, on and around us. By the time I’m ready to make another batch to restore my culture’s population, I’m sure it’s been recolonized by different genetic strains or even species of bacteria. I get my starter for the next batch from the dregs of my last jar. Here we see how home fermenters have an edge over commercial producers: go ahead and check for suitable temperature with a sanitary (not sterile!) finger, because doing so helps innoculate the batch. Many home fermentation instructions encourage home-fermenters to meticulously clean everything to “avoid contamination.” More FUD. Sanitary environments contain innoculants. Sterile environments contain no micro-organisms, and, from a food-safety perspective, are highly problematic and risky. Successful fermentation and cultural resilience is all about artistic or intentional microbial contamination of food, and the conditions and context in which the microbes develop in the food. By following a solid process, the food and culture will innoculate and take up residence in the surrounding environment, much like how we find yeast powder coating the skin of grapes. Environmental innoculation requires a sanitary, clean but NOT sterile environment. Different strains and species of bacteria have different needs and preferences. If I want to maintain the population diversity I’ve been building, then I need to maintain diversity in the population’s habitat. This is difficult for some people to think about, because we can’t clearly see the habitat diversity inside a jar: A good batch of yogurt looks uniform and consistent, even homogenous. So what gives? The habitat diversity of a yogurt culture lies within the culturing process, not so much the structural properties of the yogurt itself. Different strains of bacteria thrive at different temperatures: Some like it hot, some like it warm, some like it luke-warm, and they’ll all continue to ferment slowly at room temperature, or even in the fridge or other cold storage. Some function better than others in salty environments. Different bacteria also have different preferences or requirements for nutrients and pH balance. By feeding the bacteria more than just yogurt — such as honey, fruit, or oats, we encourage a wider range of bacteria to develop. The longer the yogurt ferments, the more acidic it will get, and acid-tolerant bacteria will start to dominate over the earlier low-acid bacteria that started the fermentation process. If the yogurt becomes acidic enough, curds will start to separate from whey, an aesthetic that people seem to love or hate, but which is ultimately harmless or even beneficial. The lactic acid responsible for the sourness is an effective natural preservative, so if you don’t plan on using cold storage to store your yogurt, ferment away! My Arabic professor was a Palestinian refugee, and he told stories of his mom making large (several gallon) batches of yogurt in an open vat in the kitchen in Haifa. It’s hot in Haifa (trust me, I’ve been there!). My professor said the yogurt was always very sour and refreshing in the heat, and that his family ate it over the course of a few weeks. The fact that this was a safe thing to do is probably thanks in large part to the heavy and progressive lactic acid fermentation that occurred in the Haifa heat. I since tried this — storing a batch of yogurt at room temperature for half a year. It got so sour that I had a hard time using it as a starter because even a little bit curdled the milk! I found it more suitable as a creamy lemon juice substitute! Strong-tasting, sure, but completely safe. Cultural diversity in this way helps protect against contamination. When we ensure that the micro-organisms that produce the results we desire gain a strong foothold early in the fermentation process and become dominant, these friendly microbial allies create an environment that is toxic (acidic and even actively poisonous) and inhospitable to (lacking food or habitat for) unfriendly pathogens. A full, unopened jar of fresh yogurt fermented at a hot temperature and stored in a relatively cool area creates a vacuum seal that minimizes the air under the lid and prevents contamination from molds and yeasts that require air to grow. It will keep for weeks outside of a fridge, and for several months inside a fridge, easily, before souring so much you have to use it as a lemon juice substitute. The rest of the techniques that I use are fairly standard, with one twist. I heat the milk to where it is scalding hot to set the proteins and repasteurize it. Sometimes, for thicker yogurt, I hold it at the scalding temperature (stirring frequently!) to evaporate and reduce the liquid. I don’t recommend adding powdered milk, because it’s often rancid by virtue of how it’s produced, which is why it tastes weird. I’ve never had a problem with milk sticking or burning on the bottom, but some folks have. I don’t measure anything with instruments. The milk is at the correct temperature when I can’t hold a warm finger in it for more than a fraction of a second. The milk is cooled enough when it feels slightly hotter than is comfortable to hold a warm finger in it. I say “warm finger” because cold fingers will absorb more heat from the milk over a longer period of time before discomfort appears, which might skew my perception toward using overly-hot milk. I pour most of the heated milk into my fermentation containers, and leave a little bit left in the bottom of the pan. To this remainder, I add my starter. I add only about a teaspon to a tablespoon of starter per half-gallon or gallon of milk. Why so little? Because the bacteria grow exponentially. Yogurt may be delicious food for us, but it is a polluted, spent growth-medium, habitat and food-source for the bacteria. If I add a lot of starter to a little milk, I’m not inoculating the milk so much as polluting the new, pristine habitat! The culture needs room to breathe and grow and blossom, and its food source (the milk) needs to be exponentially larger and more plentiful than its starting population. Otherwise, the bacteria will become too crowded too quickly. Unhappy bacteria means bad (or mediocre) yogurt. Yogurt becomes thick through coagulation of milk proteins: The lactic acid that the bacteria produce as they eat the sugars in the milk denature the milk proteins, causing each protein shift from a straight, slippery form into a twisted, knotty form. When the proteins coagulate together in an undisturbed (still, motionless) environment, they knit together to create a “protein-gel matrix.” This helps ensure consistent texture. The higher the protein concentration per amount of liquid, the thicker the resulting yogurt will be. “Greek yogurt” is simply yogurt made from evaporated milk, or milk fortified with a lot of powdered milk during its heating process. We make “yogurt cheese,” in contrast, by straining out whey (proteins and acid suspended in water) from the gel-matrix. It’s also why other protein-gel matrixes, like pectin and gelatin, get used to thicken and stabilize yogurt. Gelatin (animal-based) has great nutritional value as a wonderful protein supplement with trace micronutrients, and pectin (plant-based) contains a lot of carbohydrates. Both have a long history of safe use in human food, but I prefer gelatin for its higher nutritive value. In contrast, sometimes commercial producers add other gum-like stabilizers, with dubious or unstudied health impacts. If you want good yogurt, start with good milk and take a little extra time to reduce and concentrate it over the stove instead of diluting it with weird ingredients. I stir the starter into the milk remaining in the bulk heating vessel, then pour this mixture into the jars with the rest of the milk, and give each a good stir to ensure even mixing and distribution of the starter culture throughout the batch. Pre-mixing the yogurt starter and warm milk creates an innoculation solution that is of a much similar density to the actual milk, increasing the likelihood of even suspension and distribution and decreasing the likelihood of most of the starter culture sinking to the bottom, resulting in the “grainy sour bottom” problem in some people’s yogurts. Whisks do wonderful work to break apart the gel matrix. Here’s the twist: I’ll add a smigeon of a mesophillic dairy culture — much like kefir — to each incubation vessel before capping. This is a separate line of dairy cultures that I keep going in a bottomless vessel. It contains bacteria and yeasts that do best at around room temperature, and results in a thick, fizzy ferment at room temperature. No heating, no incubation. Just empty the vessel, refill, shake to mix on occasion, and let sit and ferment — like sourdough. I created my mesophillic dairy culture from storebought starter, added in sourdough, fruit, oats, mollasses, sugar ants, etc. I feel fairly confident about making it from scratch now, much like sourdough starter. The main difference in this culture compared to my “yogurt culture” is that I incubate the yogurt (and therefore select for thermophillic dominance). So I keep two different process lines going to maintain that diversity and add them back together with each new batch, slowly building up the mesophillic culture’s heat tolerance along the way. Sometimes, I add oats, berries, salt, honey, or spices, etc to the mixture. The oats, for example, absorb more of the liquid, create a thicker yogurt, and soften and lacto-ferment into a delicious porridge or “oat-cheese” — like a live-cultured version of oatmeal. Salt selects for lactic acid bacteria and slows the ferment, resulting in a smoother and cheesier-tasting yogurt. Regardless, I try to fill each jar close to the top, leaving between an inch to a centimeter of space, much like when canning. This is helpful mainly as a way to store the yogurt safely for extended periods of time after fermentation — it maximizes fermentation, reduces airspace and creates a better vacuum seal. Finally, I seal the jars, maybe give them a few extra shakes for good measure, and put them into incubation. I put the jars into a cooler or other insulated space, and fill it halfway or up to the bottom of the lids with boiling or near-boiling water (so the jars are never completely submerged). I poor the water over the jars to heat the remaining air inside and create a stronger vacuum inside each jar at room temperature. A friend simply places the jars by the fridge (fridges radiate heat). Another friend places them a closet underneath blankets or even down sleeping bags or coats for insulation and just ferments the yogurt for a longer time. I let the batch ferment for 6-14 hours, depending on my schedule, how sour I want the batch to be, ambient temp, how often I’ve been refreshing the culture, etc. The yogurt finishes coagulating long before it turns very sour, so much of it is preference. Again, if you plan on storing the yogurt for a long time, consider a longer ferment. As my process has improved (as well as, I surmise, the cultural diversity), I’ve found greater and greater consistency in the quality of my batches regardless of whether I incubate for 8 or 16 hours. However long I decide to incubate (and often time life decides for me), I make sure NOT TO DISTURB THE YOGURT WHILE IT INCUBATES AND FERMENTS. If you jostle it around too early in the process, you’ll break the gel-matrix while its still weak and get a less consistent texture. Practice patience and faith. I don’t use rigid temperature control, because that will create a homogenous environment, which will tend to homogenize the culture. Part of the process requires letting the milk go from hot to cool during the incubation and culturing period. It gives different organisms different timelines for work. However many hours later, I have another great batch of yogurt: smooth, creamy, even a little cheesy in texture. Err, I mean, I have another happy, full community of lactic acid bacteria, ready and waiting for their chance to do it all over again. A while ago, I came home from work and found my partner had made a batch of mac and cheese. Except, she had used the last bit of yogurt in my last jar (the one I was going to use to start my next batch). She had, in effect, killed my yogurt, a part of my family. Or so I thought. She was incredibly apologetic. She didn’t know. I was fraught and desparate. “It might not be alive,” she said. “I mixed it with the cheese when the noodles were still pretty hot.” I worked fast: I scraped out as much cheese/yogurt sauce as possible, including a lot of the noodles that seemed to have extra sauce on them. I added a little bit of milk to whatever I had salvaged as a temporary feeder, and made a batch as I normally do. I half-resigned myself to failure, half-holding my breath in suspense. At the very least, I took comfort in the fact that I had split off my yogurt starter to several others. Although mine may have died, its siblings still thrive elsewhere (hopefully). The next morning, I opened the cooler with as much cold, indifferent skepticism as I could muster. I examined a jar — it was thick. My skepticism melted into hope. I opened the jar and gave a taste. It was thick, creamy, delicious and — yes — a little cheesy. The community came out alive and well. Another little adventure for them. Here’s a toast to diversity and cultural resilience! This entry was posted in Knowledge, Making Ferments and tagged Aldous Huxley, Brave New World, Delta, Derrick Jensen, Endgame, FUD, Gamma, Joel Salatin, John The Savage, nwedible.com, Polyface Farm, Sandor Katz, Wild Fermentation on June 28, 2015 by ozob.